Caribbean Stud Poker is one of the Boss Media (GTECH G2 Interactive) games featuring progressive jackpot payout. This Caribbean Stud game is a variation of 5-card stud poker. The goal is to get a higher-ranked poker hand than the dealer. The dealer must first qualify with an Ace and a King or better. If the dealer's hand does not qualify, you win even money on the ante and keep your raised bet. Choose your chip size and place your bets. If you want to make a Jackpot Bet you must make it before the cards are dealt. You and the dealer are dealt 5 cards each, with the dealer's last card being dealt face up. If you've placed a side Bet, you'll automatically be paid out against it at this point. Next you can choose whether to Fold or Raise your hand. If you choose to Raise, your raise double your original bet and your hand will be compared to the Dealer's. This table game is easy and straight forward. 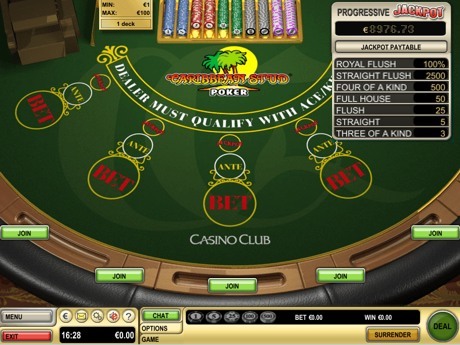 You need to place a side (Jackpot) bet to qualify for the progressive jackpot. You have the chance to win the jackpot even when the dealer does not qualify. The payout for the jackpot bet depends on your poker hand. A Royal Flush wins you the whole jackpot value. A straight Flush 2,500 and then less and less the lower your poker hand is. The house edge under the standard rules for a base poker hand is 5.22%. The house edge of the side bet is 63.76% less 2.92% for each $10,000 in the meter. So, the break-even value of the jackpot is €416,581.